The Best Sports Law blogs from thousands of top Sports Law blogs in our index using search and social metrics. Data will be refreshed once a week. New York About Blog Latest articles for Sports. Legal news and analysis on players, coaches, teams, leagues, athletics. Covers lawsuits, contracts, safety, trademarks, royalties, regulation, enforcement, legislation. Facebook fans 1,815. Twitter followers 27,252. About Blog Insights on Sporting Developments. Sports Shorts is a legal publication that publishes analysis and commentary regarding a wide variety of sports law issues. Facebook fans 2,172. Twitter followers 5,199. About Blog Sports and Entertainment Law Insider is your all-access pass to the latest legal developments impacting the business of sports and entertainment. Facebook fans n/a. Twitter followers 346. Las Vegas About Blog News And Analysis Of Legal US Sports Wagering Industry. Updates and analysis for daily fantasy sports, sports betting sites and other aspects of the rapidly-evolving online sports wagering market. Facebook fans 213. Twitter followers 7,298. London, England About Blog The latest content available from Springer on international sports law. Providing researchers with access to millions of scientific documents from journals, books, series, protocols and reference works. Facebook fans 5,406. Twitter followers 1,075. Berkeley, CA About Blog Recent documents in Berkeley Journal of Entertainment and Sports Law. UC Berkeley School of Law is one of the world’s premier law schools, educating the leaders of tomorrow and empowering them to help solve real-world problems. Facebook fans 10,095. Twitter followers 9,842. Sunnyvale, California About Blog Tarnished Twenty is a view of sports from a legal perspective, addressing how the law impacts athletes, teams and the sports industry at all stages and levels. Facebook fans 42,278. Twitter followers 19,346. About Blog Proskauer's Sports practice highlights the latest sports law-related items. Proskauer, founded in 1875, is a global law firm providing a broad range of legal services to clients worldwide. Facebook fans 320. Twitter followers 2,166. United Kingdom About Blog LawInSport is a leading online international sports law publication providing expert commentary and analysis on the latest issues and legal developments in the world of sport. We publish articles of legal opinion, blogs, videos and podcasts by those working in the field. In addition to our legal content we also provide helpful information about sport law firms, books, conferences and courses. Facebook fans 870. Twitter followers 12,221. The Hague, the Netherlands About Blog Our International Sports Law Diary. The AISLC provides high quality research, services, and products to the sporting world at large on both a national and international basis. Facebook fans 361. Twitter followers 4,374. 1 Elk Street, Albany, NY About Blog Articles on Entertainment, Arts and Sports Law Section of the New York State Bar Association. Facebook fans 5,557. Twitter followers 11,430. British Columbia, Canada About Blog A Combat Sports Legal Resource. This blog follows legal developments addressing issues concerning Mixed Martial Arts and other Combat Sports across Canada and the US. Facebook fans n/a. Twitter followers 4,508. About Blog There is no such thing as "sports law," but this site covers all things legal relating to the sports world. Facebook fans n/a. Twitter followers 5,199. London About Blog Award-winning London law firm, providing advice to domestic and international clients in four sectors: sports, media, tech and lifestyle. New York City About Blog Providing high quality legal advice and services in the area of sports. Facebook fans 316. Twitter followers 2,710. About Blog International law publication tracking developments in the regulation of sport. Facebook fans n/a. Twitter followers 5,025. Cambridge, MA About Blog Harvard Law School's journal for issues related to legal developments and themes in sports & entertainment. Facebook fans 1,247. Twitter followers 1,055. About Blog He frequently serves as an expert speaker to law schools, including Harvard University, Boston College, Hofstra University and Arizona State University, and bar associations regarding sports law issues, including agent regulation and salary arbitration. Connecticut About Blog Covering the Intersection of Sports and the Law. Connecticut Sports Law will provide insight, opinion and information on the law and business of sports, which has become inseparable from the sports themselves. Facebook fans 111. Twitter followers 935. About Blog A new website dedicated to providing high-quality analysis of sports law and business issues. Michigan, USA About Blog A blonde who loves to talk legal news and issues in sports. Facebook fans 198. Twitter followers 666. Milwaukee, Wisconsin About Blog Analyzing the confluence of power, sports and law. Facebook fans n/a. Twitter followers 560. About Blog Sports Score offers you current, relevant and practical commentary relating to current legal events in the sports industry. About Blog Critical analysis of all sports law developments. Independent and expert views. Bengaluru, India About Blog The Sports Law & Policy Centre, Bengaluru is an independent think-tank focused on interdisciplinary research, scholarship, education and institutional support for public and private enterprises in areas relating to the legal, policy and ethical issues affecting amateur and professional sports in India. Facebook fans 156. Twitter followers 399. 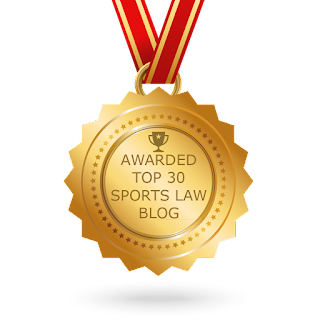 CONGRATULATIONS to every blogger that has made this Top Sports Law Blogs list! This is the most comprehensive list of best Sports Law blogs on the internet and I’m honoured to have you as part of this! I personally give you a high-five and want to thank you for your contribution to this world.